In this era of Information Technology, the complex PC deals with many daily tasks. The occasional sudden power failure can cause severe loss of the data for business computer systems. The uninterruptible Charger Box provides a backup power battery source to the operating PC. We deliver a new UPS system called Charger Box which provides constant power to keep your PC running steadily. When a power failure occurs, Charger Box provides backup power giving you enough time to switch off your PC. 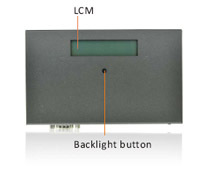 We recommend that the charger box be used in an Atom based Panel PC or Box PC of no more than 15 inches in size. We provide easily recognizable software interface which provides a power capacity Indicator on the display after installation. In addition, when the power capacity of the charger box is down to 10% the box sends out an alarm; at 3% the power switches off. We provide the Online structure Charger Box. The batteries are always connected to the inverter so that power transfer switches are unnecessary. In the event of power loss, the rectifier simply drops out of the power circuit, and the batteries keep the power flow steady and uncharged. The top of the Charger Box has a small LED indicator which displays the status of power use and battery charge. 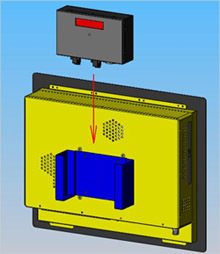 Charger Box provides 75x75mm VESA Mount bracket with each unit, which customer can mount the box on the rear side of the display which brings flexible mounting solution to customers.